The best way to keep your hamster's fur clean is by providing your hamster with a chinchilla sand bath. Please bear in mind that if you decide to give your hamster sand bath, then you have to use only Chinchilla Sand and not any beach sand since the Chinchilla Sand (that you may buy from your local pet store), will be pure and clean. A hamster sand bath will help the hamster keep its fur clean and shiny. 3. See your hamster take a sand bath! 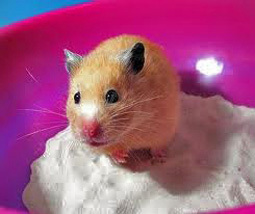 Many dwarf hamsters enjoy sand baths while most Syrian hamsters ignore it :( If your hamster ignores the sand bath, and you see that your hamster's fur is not clean, then the best option is to replace the hamster's bedding more frequently. 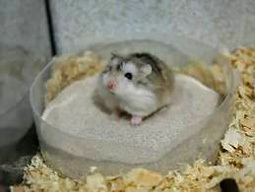 Do not apply any sprays that you may find in pet stores... these are not all safe and remember, never bath your hamster.